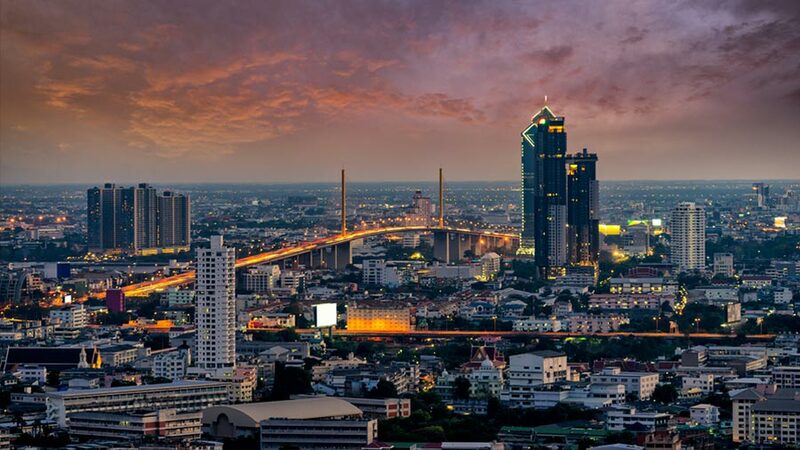 Thailand’s Board of Investment (BOI) offers a range of tax and non-tax incentives to foreign companies making investments that are deemed highly beneficial to the Thai economy. In 2015, the BOI announced a new seven-year investment promotion strategy (2015-2021) that offers special privileges to foreign investors. Under the strategy, tax-based incentives are granted according to the group classification (A or B) for the activities and the merit of the project (if any), whereas non-tax benefits are available to all projects regardless of the type of activity or conditions. These business activities are classified into groups based on the level of importance. While group A activities receive tax as well as non-tax benefits, group B activities receive mainly non-tax benefits and certain import duty benefits, if applicable. Activities falling under each group classification and the incentives granted for each group are immediately below. A1: Knowledge-based activities, focusing on R&D and design to enhance the country’s competitiveness. A2: Activities in infrastructure for the country’s development, activities using advanced technology to create value-added, with none or very few existing investments in Thailand. A3: High technology activities which are important to the country’s development, with a few investments already existing in Thailand. A4: Activities with lower technology than A1-A3 but add value to domestic resources and strengthen supply chain. B1-B2: Supporting industries that do not use high technology but are still important to value chain. Deduction from net profit for ten years of up to 70 percent of the investment amount in addition to the normal depreciation deductions. Additionally, tax incentives are granted to the following new categories of activities. 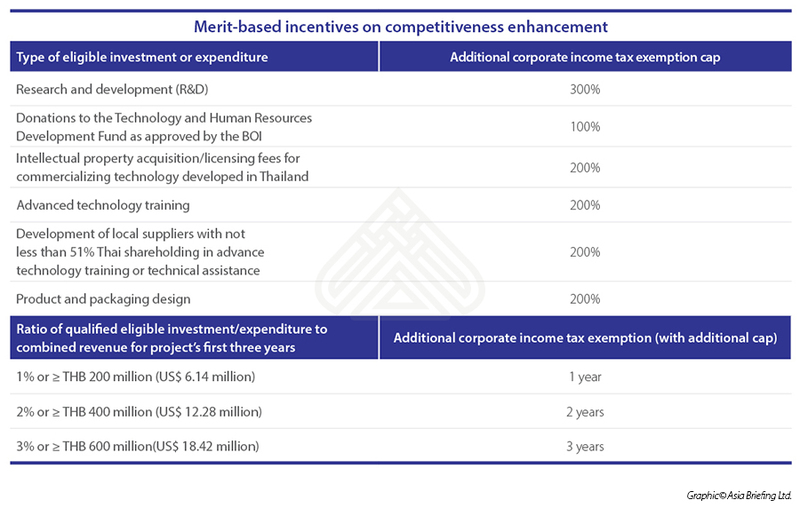 These incentives are granted to encourage investment or expenditure in certain types of projects involving enhancement of competitiveness (as shown in the table below), decentralization, or industrial area development. Additional 25 percent reduction of the installation cost. Projects situated in the industrial estates or promoted industrial zones will get one additional year of CIT exemption. These areas include: Nakhon Phanom, Bueng Kan, Sakhon Nakhon, Phrae, Chaiyaphum, Roi Et, Kalasin, Nan, Buri Ram, Yasothon, Maha Sarakham, Ubon Ratchathani, Hong Son, Mukdahan, Mae, Nong Bua Lamphu, Si Sa Ket, Sa Kaew, Surin, Sukhothai and Amnatcharoen. There are several other incentives available to businesses operating in the following regions. Exemption of import duty on machinery and imported raw materials. Additionally, there are reductions available in CIT, personal income tax, and final tax. 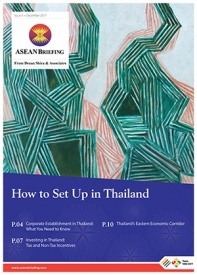 This article is an excerpt from the December 2017 issue of ASEAN Briefing magazine, titled “How to Set Up in Thailand” In this issue, we analyze the various market entry options available for investors interested in expanding to Thailand. We also discuss the various tax and non-tax incentives on offer for foreign investors in the kingdom. 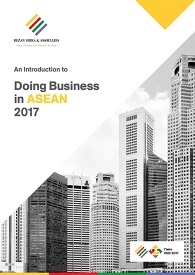 Finally, we discuss the salient features of Thailand’s EEC development plan and highlight the key incentives on offer for overseas investors.